I call myself an “event designer” with intention. I help brides design their day and bring to life what they envision. 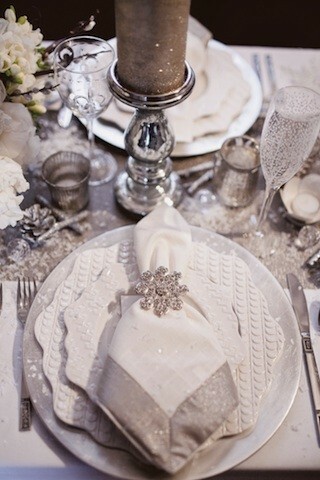 I’m definitely a wedding planner, but with a focus on creating an aesthetic for my clients. With that said, I’ve been wanting to write a post that explores the grey area of both the similarities and the differences between planning and designing. 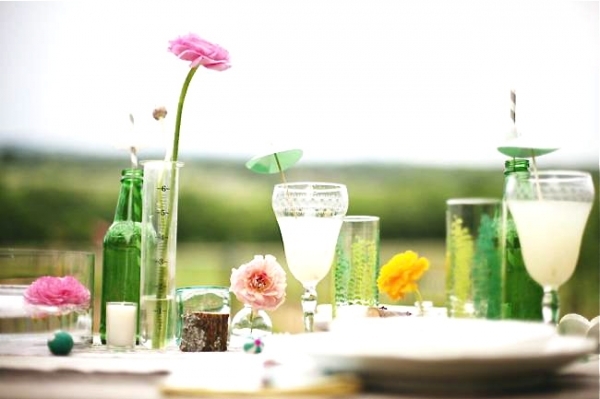 Event designing is the big picture… assessing what the couple wants their event to feel and look like. As the lead designer for Lovebird Style, in my initial meeting with a bride we talk about what she likes, is drawn to and feels like expresses who she is. In planning consultations, we plan what everything is going to look like and use an inspiration board as our “big picture” point-of-reference. Planning is an essential part of event design, but keep in mind that planning does not equate to styling or design. Why you might ask? Because designing starts with the big picture, planning the logistics brings the design together and then the plan must be executed. A seamless execution is imperative for any event… just think about what will happen if there’s not a schedule in place or a point-person to oversee that your plans are carried out the way you want. It’s great to have family and friends who are willing to help lend a hand, but most likely they haven’t been a part of the planning and designing process, so it’s wise to let someone else do the heavy lifting on your wedding day. Is there are part of you that just wants to run away and get married? 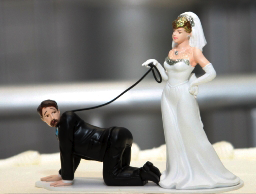 It seems like most couples toy with the idea of having a destination wedding and going through with it has become increasingly popular. When I was planning my wedding, having a ceremony at the beach was definitely in the cards. Even though we didn’t decide to do a destination wedding, it’s a great option for couples who don’t want a traditional wedding or simply want to celebrate somewhere away from home. I wrote a post recently for tree.com that explores some of the pros and cons of having a destination wedding. You can read the full article here. Weighing your Options – When you’re a new bride or groom, it’s easy to get overwhelmed with all the decisions you have to make. If you choose to have a destination wedding, your options are often limited to what the venue (or resort) provides and their list of preferred vendors. When you don’t know an area very well, you’re more prone to go with what the venue offers and that can make the decision-making process a little easier. However, if you’re a picky bride and you want a lot of unique details, you should think twice before booking a venue that makes those decisions for you. For a couple months now, I’ve been addicted to the website Pinterest. But it’s a healthy addiction because it fuels my creative mind and helps me connect and better communicate with my brides! For every client, I start out with an inspiration board to organize the overall aesthetic for their event. Until I was invited to the Pinterest community, I was doing this through a limited google image search. 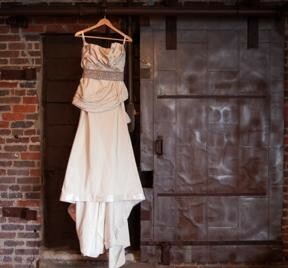 Pinterest serves as a great tool to categorize ideas and inspiration, including ones I have for my brides. If you’re interested in pinning, I’d be more than happy to send you an invitation… just let me know. 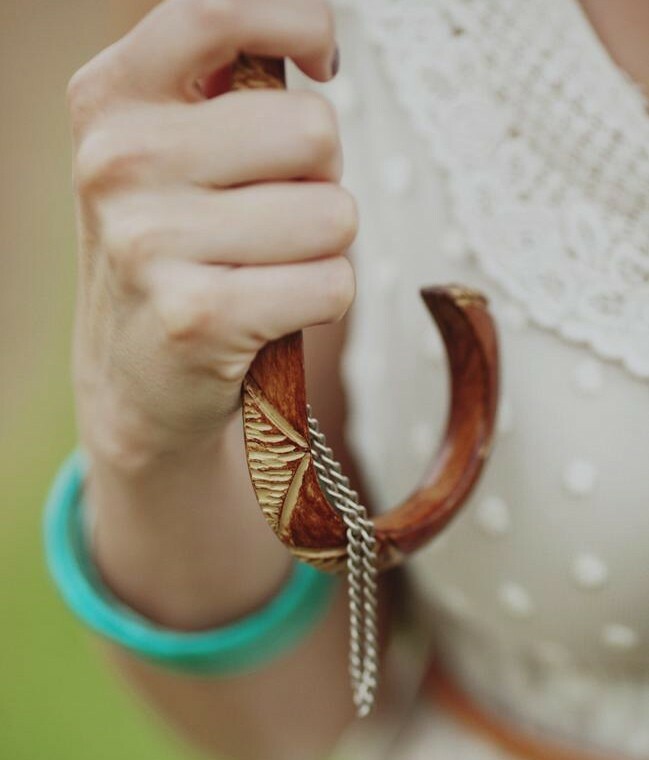 And if you’re already a veteran and interested in my pins, I’d love for you to follow me here: http://pinterest.com/jessburgess. 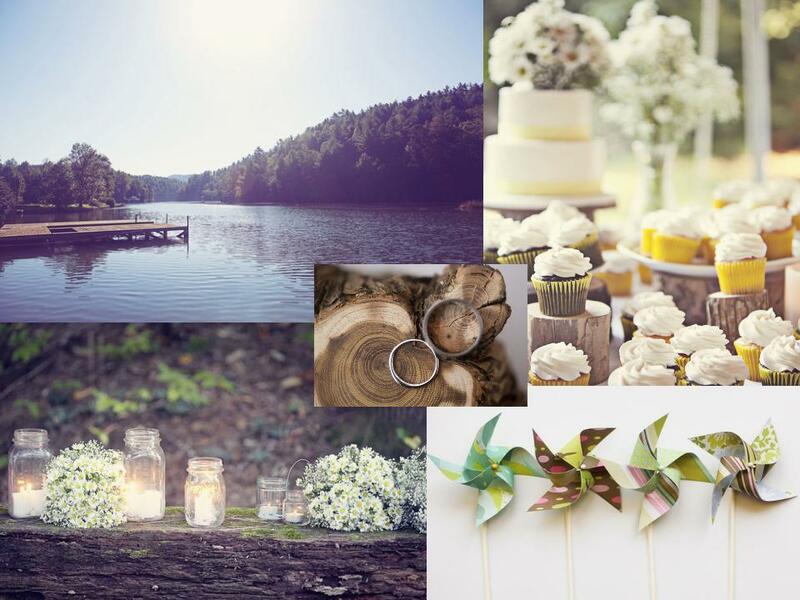 And to show you what I mean, here’s the inspiration board for my next wedding at the end of this month. It’s for a very special gal, and I simply can NOT wait! 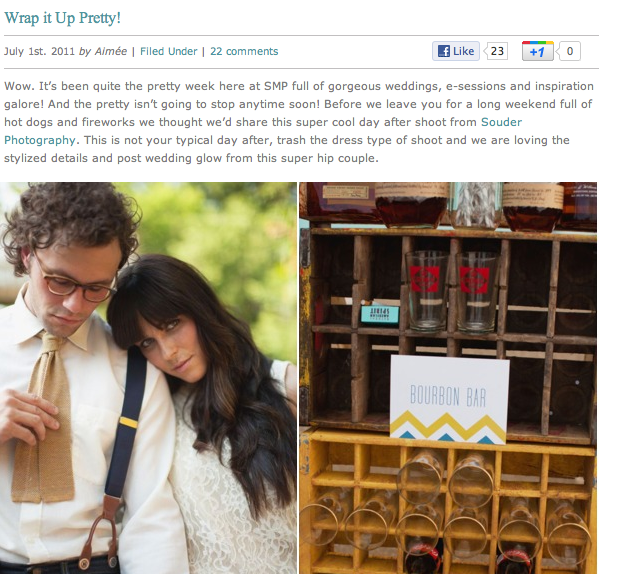 We are so excited that our retro “just married” shoot is featured on Style Me Pretty! We absolutely adore Style Me Pretty! It was so inspiring to peruse the lovely wedding eye-candy that they selectively feature, back when I was planning my own wedding. And it’s my goal to produce that same level of quality with every stylized shoot and wedding/event that Lovebird Style designs. So without further adieu, it’s our honor to share this with you and we’d love to know what you think! I’m just a girl who has been in 10 weddings, planned my own wedding and is having a blast helping other brides plan and pull off their special day. But since I’ve had these experiences, I wanted to share some common mistakes that can very easily happen when you’re wedding planning. Rest assured… the good news is, these mistakes are just as easily avoidable if you’re aware of them! Here’s my top 10 list of mistakes. You can read how to avoid these mistakes in the entireblog post here. I would love to know if you have any other mistakes to add to the list! I am so excited and ready for our wedding tomorrow! Allison and Stu are a super cool and laid-back couple who wanted to celebrate their nuptials not only outdoors, but lakeside. Their goal was to create a day where they could relax and have a good time with their family and friends. And it’s sure to be a blast because this couple is all about fun! So I wanted to share a small inspiration board as a sneak peak of what’s to come. We’re using a white and yellow color palette to contrast with the the green and brown of the beautiful lake setting. The margaritas will be flowing and I expect a lot of dancing by the pool. For the decor, we’re using lots of wood, wildflowers and rustic elements, but with a fun and unexpected twist… colorful pinwheels! So you’ve spent all this money on your wedding photography – because you obviously want amazing pictures of your special day – and now you also have this “engagement session” included in the cost. 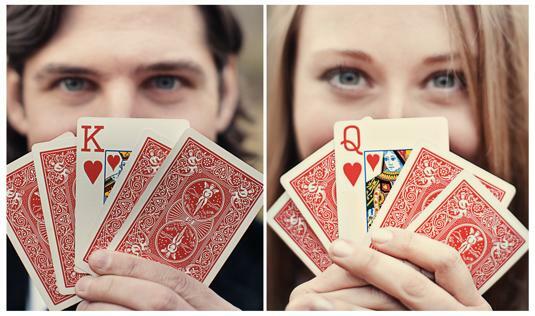 What are you going to do with engagement photos? Well… they should be photos that represent your relationship that you can look back on with a smile! And with a little effort, you can get some great pictures before you walk down the aisle. Read my styling tips on what to wear, where to shoot, and what to bring here! 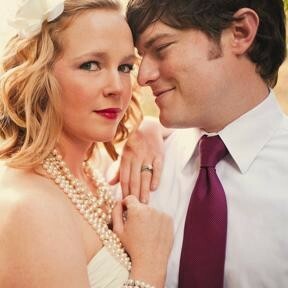 And if you feel like you need a little help, I offer styling services for engagement shoots. 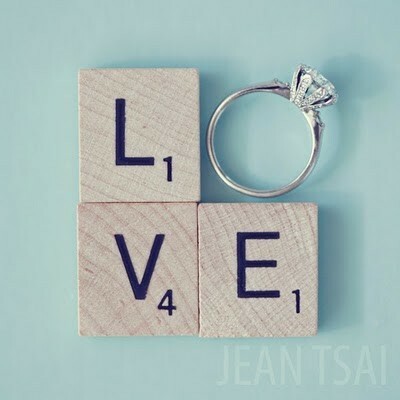 I love consulting with couples on how to bring it all together and make their engagement pics unique and personal! When Souder Photography asked if I wanted to style a shoot with a “James Dean” feel, I was so excited! An opportunity to work on something retro and full of style… um, yes please! So Meg and I worked together to come up with 1950’s inspired shoot. We had a great couple who had just gotten married, so we came up with the idea to do a “just married” shoot. We ran with the concept that after the wedding is over, they can begin their journey together. You can see my inspiration board I put together on Pinterest here! Huge thanks to Souder Photography for the gorgeous photos and to Old Made Good (OMG) in East Nashville for supplying some fabulous props. I have to say… we’re pretty proud of how it turned out! 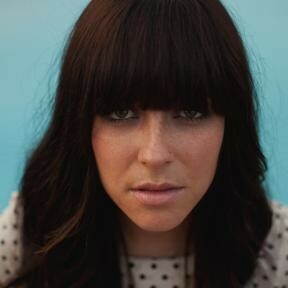 You can see the feature on Style Me Pretty here! I will always treasure the memories I have how my gracious friends showered me with lots of good times and gifts! Have you been to any really fun showers or engagement parties? Let’s face it… we’ve had some pretty crappy weather in the South this spring! The question that worries so many couples this time of year – be it an outdoor bridal shower, rehearsal dinner or the actual wedding – is what to do if it rains? The Lace * Paper * Flowers team paired up with Ulmer Studios to showcase an event that embraces the grey skies! You may remember seeing the “april showers” inspiration board that I posted last month. It was an honor to do this shoot for a couple that were victims of the Nashville flood exactly one year ago! 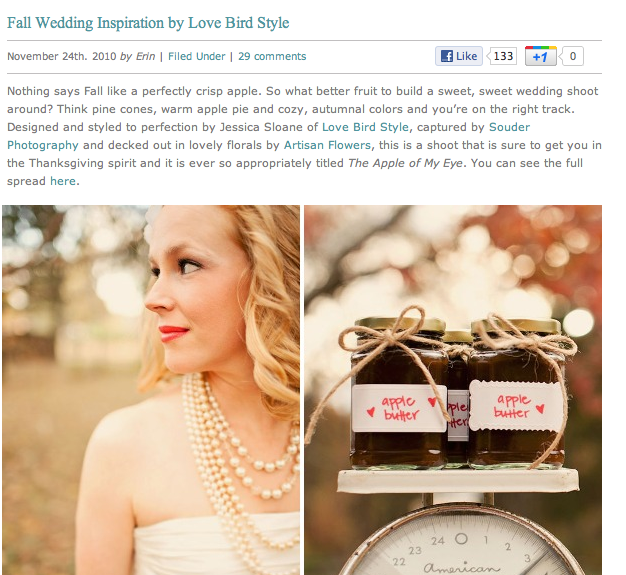 And I’m also flattered and excited to be featured on Ruffled again today! You can see the Ruffled feature and gallery of photos here…. 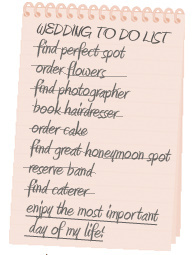 Draw from your experience – Think about the weddings you’ve been to – which ones do you remember with fondness? Which ones stand out to you? Now think about the progression of that event and what about it you enjoyed the most. You obviously experience a wedding differently as a guest than you will as a bride, but this is a helpful exercise to figure out the type of event you want to create for your guests to enjoy. 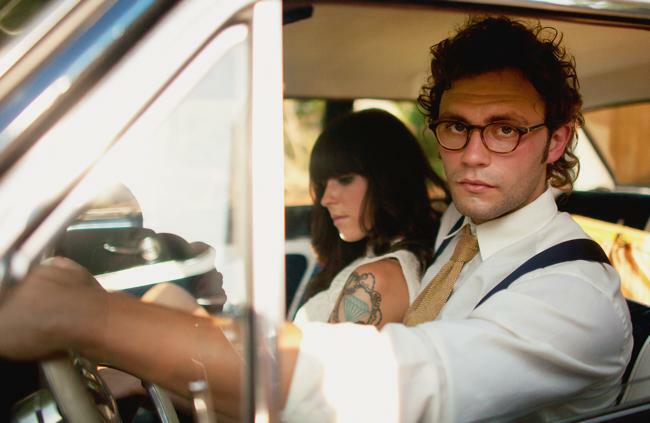 Were your favorite weddings casual or elaborate? Laid back or formal? Did they have a great band or awesome food? How did that wedding look? For me, it was an outdoor wedding where the reception was held in a barn. I loved the casual, laid-back feel of that wedding and was on the hunt for a venue that could offer that experience for my big day. 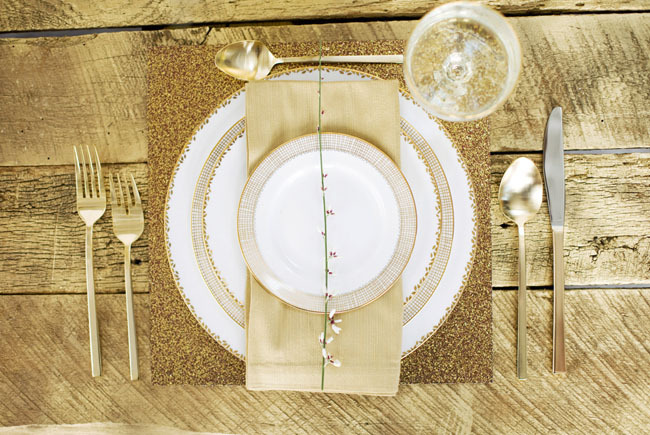 Get inspired – Once you’ve figured out your “wedding feel”, start looking for inspiration. Blogs are a fabulous way to search for visuals that are appealing to you. Also, look in magazines – wedding magazines are a given, but often times you’ll find inspiration in other places like fashion or home decor. Pay attention to what you are drawn to, what colors, textures and objects you find appealing. At this point, you don’t have to know why you like something or how you might incorporate it. Just knowing WHAT you like can make all the difference! I’m excited to announce that I’m a contributor for the Lifestyle & Leisure blog at tree.com, focussing on life celebrations, which includes weddings! I wanted to share a little bit from a post I wrote about current wedding trends as well as an article I found on BRIDES magazine online that highlights the best wedding ideas from 2010. Did you embrace any of these trends or do you plan on doing so? Weddings used to be focused on tradition and ritual, but these days things are looking much more relaxed. Couples are venturing outside the box to celebrate their relationship in unique ways and still stay true to who they are. 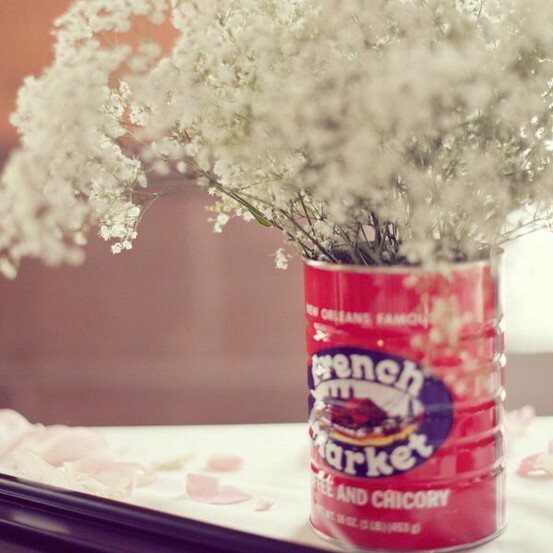 Let’s take a look at some of the current wedding trends. Unexpected Venues – Whether it’s a barn, warehouse, vineyard, theatre museum or even your own backyard, couples getting hitched aren’t simply heading to church anymore. While marriage in a church has been the tradition of choice for many over the years, couples are exploring an array of other possibilities to find the perfect site for their big day. Historical buildings, outdoor spaces and even ranches rented by the night or weekend (what a celebration!) are just a few more nontraditional sites that one could consider. 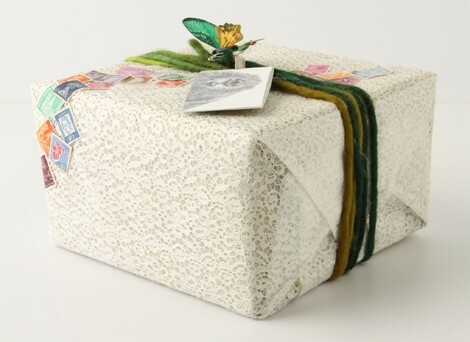 Do It Yourself – DIY is prevalent because brides know that it is the biggest way to cut costs and stay within their budget. 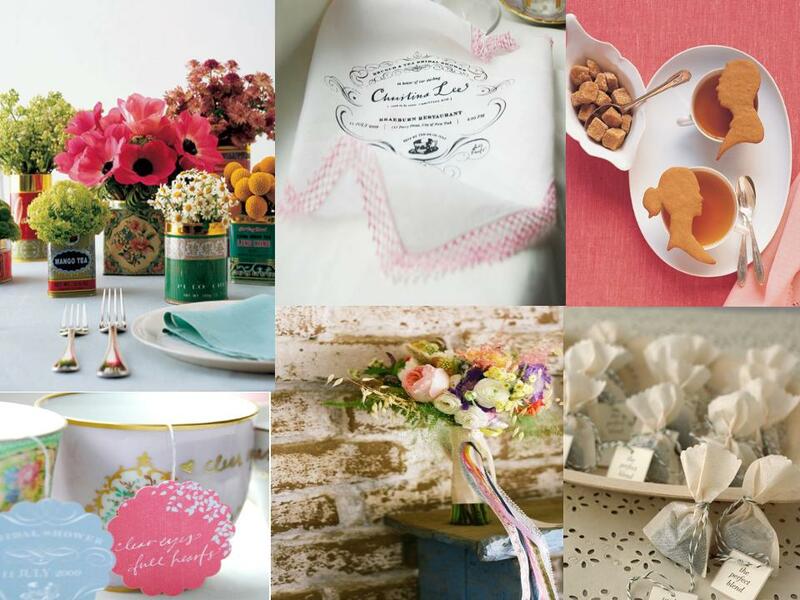 On anything from flowers, decor, place cards, invitations, and favors, brides, along with close friends and family, are tapping into their inner craftiness. 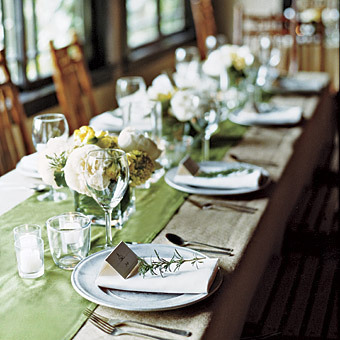 For instance, one trend is using wine bottle labels as table numbers and corks as place cards holders. Decor has gotten “crafty” as we’re seeing paper and fabric pom-poms, bunting, garland or streamers being used instead of extra lighting. And from BRIDES magazine, be sure to check out “The 100 Best Wedding Ideas of 2010” as well as “The Most Memorable Trends” in wedding style of 2010. We are excited that our “Steampunk” inspirational photo shoot was published today on Forget Me Knot Weddings today and that we can share it with you! When the girls of lace * paper * flowers were putting their designer heads together to come up with our next inspirational photo shoot, “steampunk” came up and we struggled to verbally define it! As the designer behind the concept, I invested tons of time researching the mystery of steampunk and approached this inspirational photo shoot as a challenge. 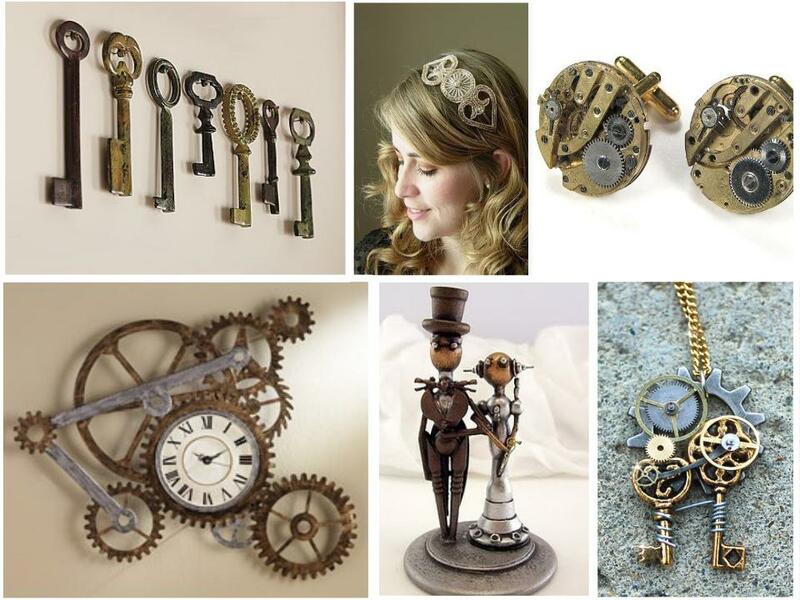 I was pleasantly surprised when I found it encompassed components that I naturally find myself drawn to… timepieces, gears, keys and locks, an industrial aesthetic mixed with antiques, gold tones and deep colors. We wanted to take this aesthetic movement and apply it to a wedding because we believe it translates the romance and mystery of a lost era…. I hope you enjoy! The creative minds that make up Lace * Paper * Flowers started brainstorming for our next inspirational shoot while we were in the middle of the steampunk shoot! We had a gloomy winter in Nashville, so we knew we wanted to do something warmer and brighter for our next project. 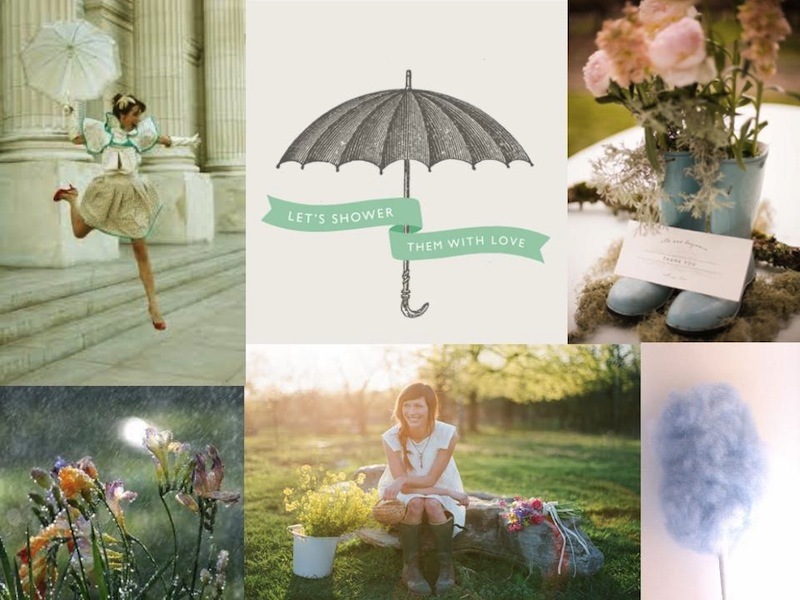 Jasmin, from Artsian Flowers, suggested we do an “April Showers” theme. And as the saying goes, April showers do bring May flowers, so you can expect this shoot to be full of vibrant colors and whimsy! Here’s the inspiration board I created for the shoot that we’ll be working from to pull together a fun design. I can not wait to work with Ulmer Studios on this shoot and I feel certain it won’t be the last time. Stay tuned for more! 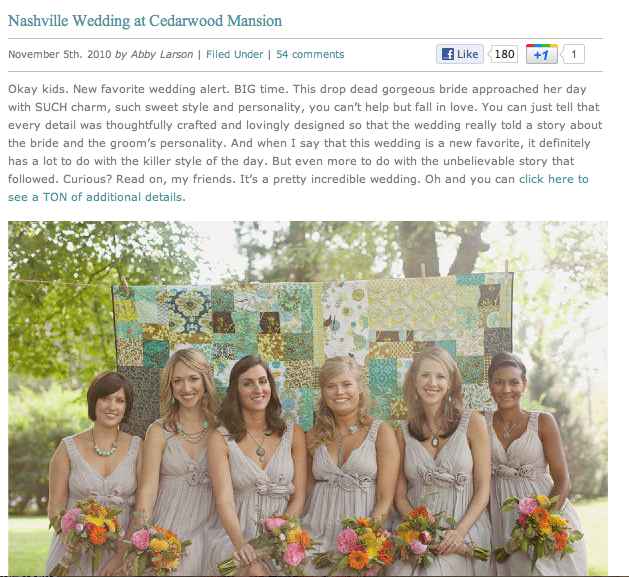 The moment that we decided to do a color week of aqua, my mind immediately went to this fabulous Nashville wedding that I had seen on Style Me Pretty a few months back, held at the lovely Cedarwood. Jessica, the bride, did an amazing job working with Cedarwood to craft an event full of personality, with a whimsical bird theme and a vibrant color palette of aqua, teal, pink, yellow and green. Jessica collected antique birdcages for the centerpieces and painted them in shades of aqua and teal and found precious aqua birds at a local antique store to use as decor. 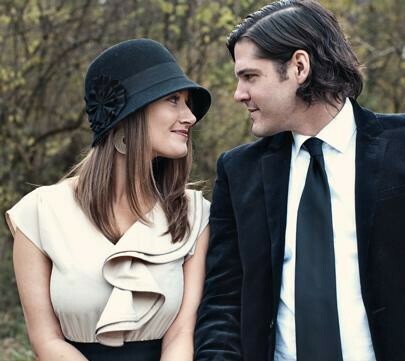 Thanks to Jessica and her wonderful photographers, Souder Photography, for sharing! I remember walking away from our meeting still thinking “what is steampunk?” As I invested more time in researching the mystery of steampunk, I found that it encompassed components that I already find myself drawn to… timepieces, gears, keys and locks, an industrial aesthetic mixed with antiques, gold tones and deep colors. The definition I liked the most, I found on another blog. Here’s a good summary…. Steampunk: An aesthetic movement based around the science fiction of a future that never happened. Recall, if you will, visions of the future that were written a hundred years ago or more… telling stories featuring technology that didn’t exist at the time, but might someday. Remember that they were writing with no idea of the microchip, or the internet, or even the internal combustion engine. Therefore, in their versions of the future, the technology upon which society would eventually come to depend is driven largely by steam power or clockwork. So we are gearing (no pun intended) up for the shoot next week and I wanted to share the inspiration board I designed for it. We have some amazing local vendors working with us to pull this shoot off and I cannot wait to see it all come together! If you are not familiar, Pantone is known worldwide as the standard language for accurate color communication, from designer to manufacturer to retailer to customer, across a variety of industries… including the wedding industry. 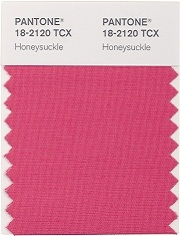 Each year, Pantone names the color of the year and this year, they announced the 2011 color is honeysuckle! 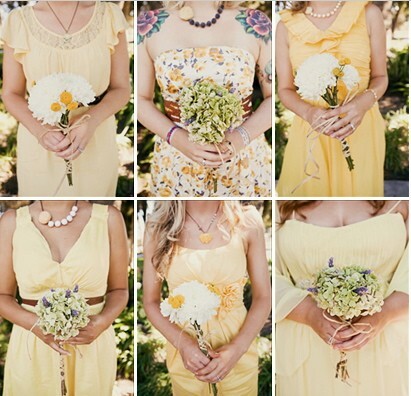 So what does this color mean for the wedding industry? Pink is always a popular wedding color, but this year it could bring new inspiration. I don’t personally love using a lot of pink, but I definitely appreciate using it in more subtle ways. 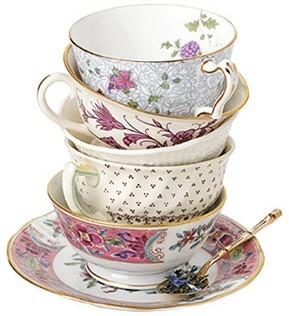 And what better way than a garden tea party to get us inspired for the wedding season! 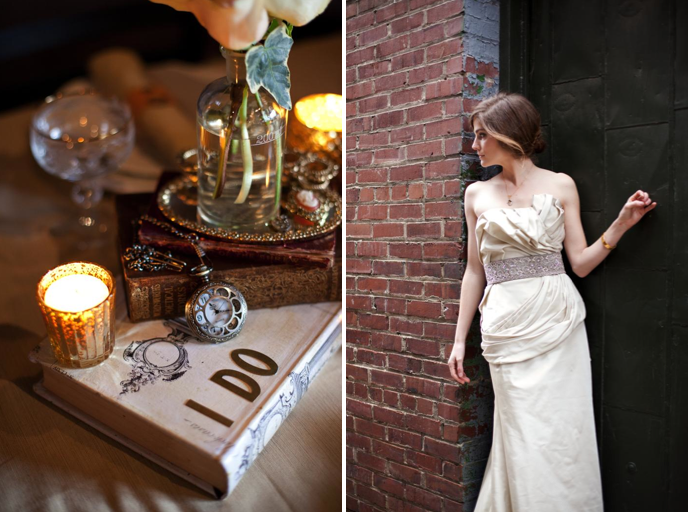 I created this inspiration board with a neutral backdrop in mind…. white lace and light khaki linens would be the perfect compliment. 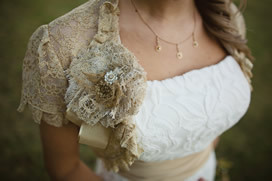 My heart just fluttered… I got wind of the BHLDN sneak peek today via a tweet! Wedding and event dresses galore, courtesy of Glamour Weddings. Click to enlarge each image and get ready to swoon! Prices for wedding dresses range from $1,000 to $4,000. Could be worse. Which one would you pick? Like the rest of the BHLDN stuff, which also includes shoes and accessories, these dresses will go on sale in the BHLDN online boutique Valentine’s Day. 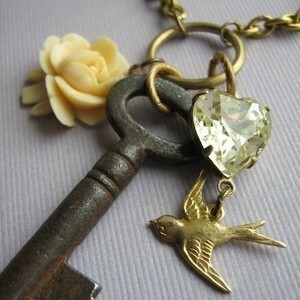 Follow Love Bird Style on twitter here! What’s popular in interiors often translates to the trends you see in the wedding world. 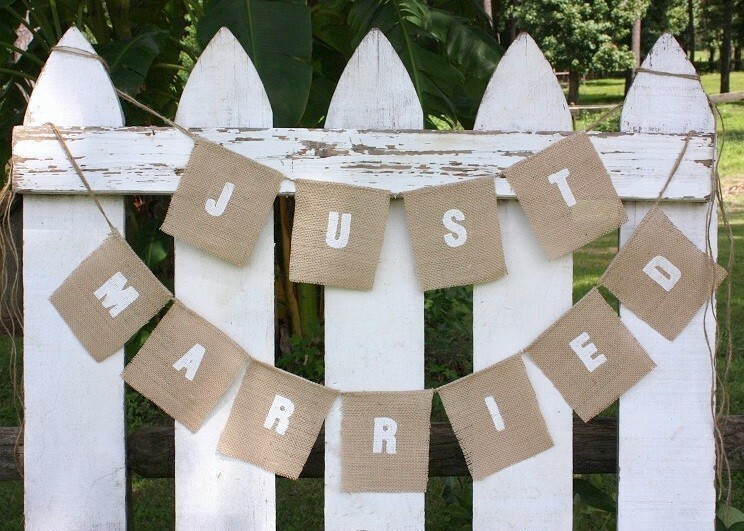 If you asked me to name just one thing that stands out as a wedding trend, I’d have to say burlap. It’s everywhere and I love it! 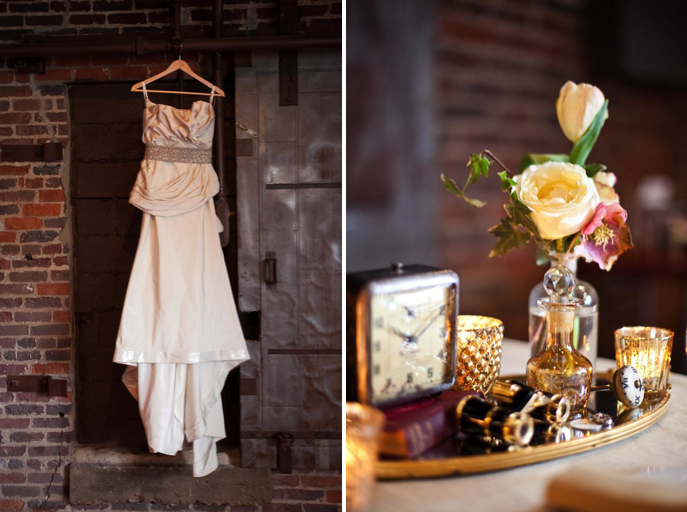 Brides are wanting to add texture and more rustic elements with the elegance of their big day. When I started planning my wedding over a year ago, it wasn’t so prevalent. In fact, I thought I was being pretty original by requesting burlap table runners and using burlap to make our welcome bags… turns out, I was just a little early. 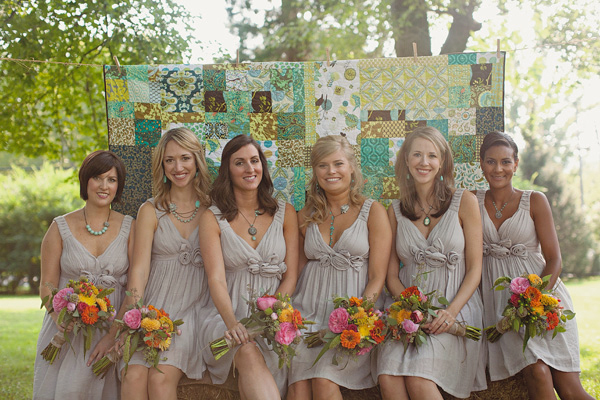 There are so many ways to incorporate burlap into your dream day, but you have to be careful to not overdo one thing. Coming up with your wedding “style” does not mean making everything match. 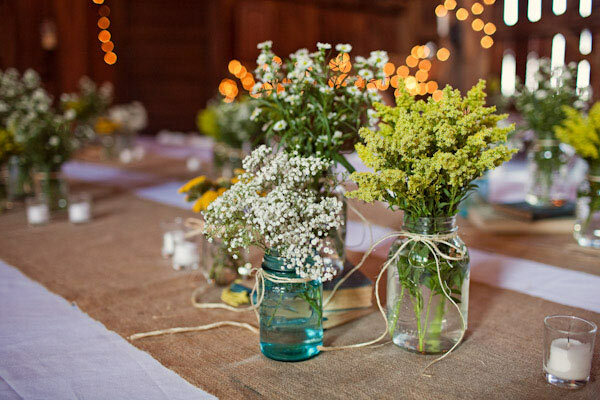 So if you’re wanting to add burlap to enhance your rustic wedding, compliment it with wood elements such as birch bark vases or wood cake stands. Or if you are going for a more elegant look you can mix the burlap with modern or industrial pieces that will be both interesting and minimalist. 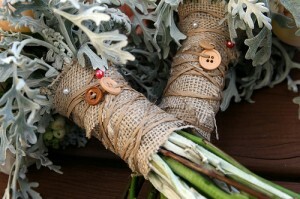 Burlap is both visually appealing and cost effective! It is however, hard to clean… which is why rental companies typically do not carry it, but might carry a linen blend that offers a similar look. So if you’re looking to use burlap on your tables (usually a table runner looks best), keep in mind that they can’t be thrown in the washing machine afterwards. And while some brides are drawn to the raw edge, it often frays, so it’s better to purchase a higher grade of burlap which can easily be found online. Or consider sewing the edges of the runner to give it a more finished look. 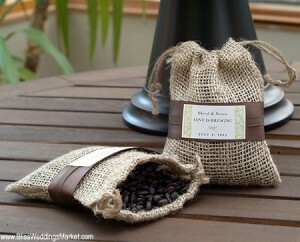 For wedding favors, I love the idea of putting coffee beans in burlap bags. 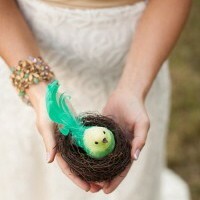 How cute is this idea from Bliss Wedding Market? 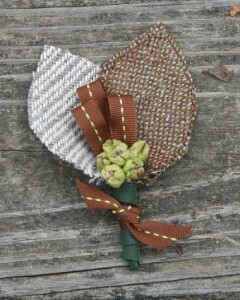 Another popular choice is to wrap burlap around your bouquets or use it in the men’s boutonnières! 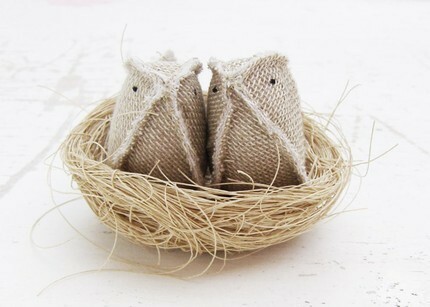 Burlap mixes well with jute, twine or a rustic ribbon. The great natural color, texture and affordability of this fabric makes it a trend that brides just can’t get enough of… I think it’s here to stay! 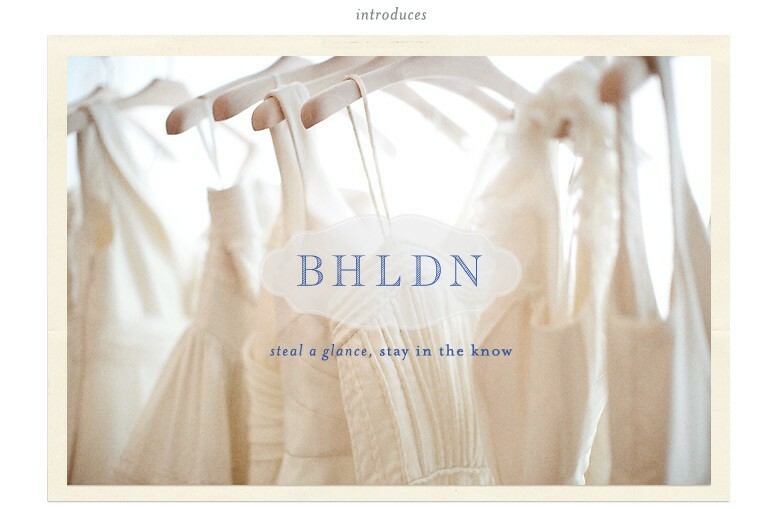 If you follow (correction, “stalk”) Anthropologie like I do, then this will be old news… I’ve known for a long time Anthro was coming out with a bridal line in Spring 2011. And yes, I even considered postponing my wedding accordingly but I decided that might be taking it a tad too far. The mega lifestyle retail company (including Urban Outfitters, Free People, Leifsdottir and Terrain) announced today that the line is launching its online boutique on Valentine’s Day!!! BHLDN (beholden?) is what they are calling the romantic wedding brand. Rumor has it, a physical store will open later this year in a major city (NY?). AND… the site is up and running as a teaser! Married or not, I’ve already signed up for their emails. Accessories and decor are scheduled to follow. 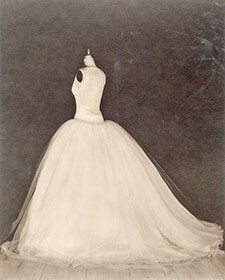 In the meantime… I’m considering pretending that my wedding did not happen so I can wear an Anthro wedding dress. I have to admit, I wasn’t really looking forward to dress shopping when I got engaged. Why? Because I have expensive taste! I like things BECAUSE not everyone likes them. I usually try to fight the hottest trends or at least not embrace them fully… Although, my husband would disagree with that statement and point his finger at my closet! The point is, I’ve always been drawn to classic and romantic pieces. So when it came to the difficult task of finding a dress that was unique, beautiful and within budget, I thought I was a goner. To my surprise, I found MY dress the first day I started looking. It was the only dress in the store that I genuinely loved and it was perfect for me. So here are some ideas for looking outside-the-box when searching for your perfect dress at a great price! 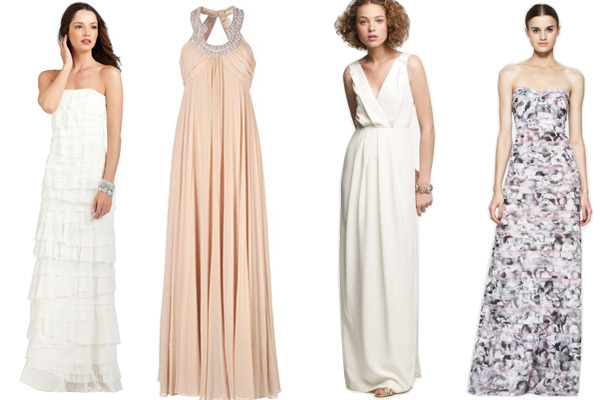 Ann Taylor, Strapless Tiered Gown, $495, available at Ann Taylor; Apart Infinity Goddess Gown, $378, available at Apart; J. Crew Washed Crepe Aveline Gown, $750, available at J. Crew; BCBG Max Azria Floral-Print Gown, $398, available at BCBG Max Azria. A new year brings excitement and anticipation of what’s to come! 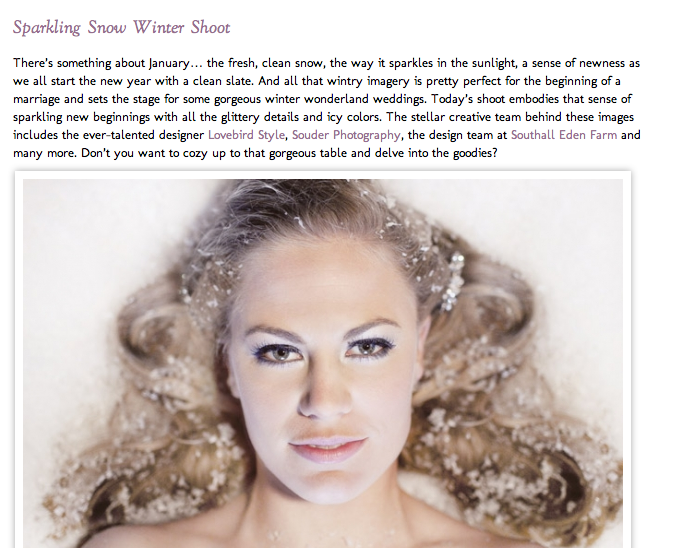 So instead of having the post-holiday blues, Souder Photography and I teamed up with some great vendors to style a shoot that highlights the white and silver beauty that only winter can reflect. This wintery white setting would be the perfect backdrop for a holiday engagement or a couple that wants their matrimony to truly sparkle & shine! 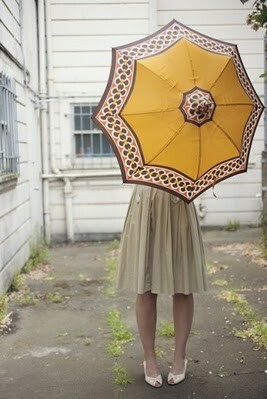 Thanks so much to Ruffled for featuring this shoot here!!! after 30 years of going to weddings and being in 10 weddings, i had a pretty good idea of what i did not want to incorporate in my own wedding… trick was, i wasn’t exactly sure about everything i did want. i started asking myself questions and thinking back to some of the weddings i had been to that i really enjoyed. i envisioned different aspects of my special day and took note of what i was drawn to. tearing out pages of magazines and reading blogs helped me further define my wedding style. 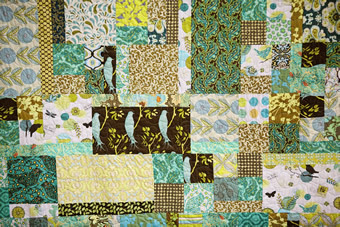 i started with a quilt that i had found on etsy.com that my parents purchased for me as a christmas gift. and before i knew it, i had pieced together a cohesive and unified look that i was more than pleased with. DIY projects were appealing to me because i wanted to add a personal touch to our event. over the 9 months that we were engaged, i collected 13 birdcages. i painted 10 of them aqua/teal and distressed them by hand. i used the white ones for the guest book table and our table. combining them with antique tins, bird figurines, blue mason jars and funky garden flowers completed the vintage whimsical look i had envisioned. after picking out the bridesmaids dresses at anthropologie, i immediately wanted to start working on customized jewelry for each bridesmaid to give them as one of their gifts. i found an incredible jewelry designer on etsy.com and worked with her to design a unique set for each girl based on their individual taste and personality. i was pretty happy with how they turned out! take a look at some more pictures captured by the fabulous duo that is souder photography….